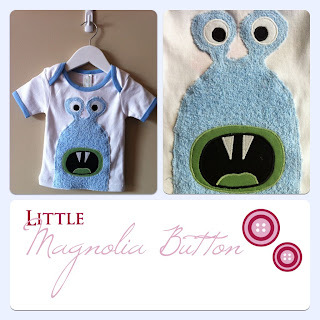 The fifth giveaway in the bonanza is from Little Magnolia Button. Little Magnolia Button creates handmade clothing, accessories, toys and gifts for your child or little person. Little Magnolia Button loves bright, happy colours and cute designs and all items are handmade by owner, Bridie Premraj. Features: Size 0 organic cotton t-shirt with a monster applique made from cotton terry and quilters cotton. This t-shirt is particularly good for a dribbling baby as the terry towel body will absorb some of the drips! Machine washable, though hand washing will prolong the life of your monster. This t-shirt has been created using a Fuddie Duddie's template. Valued at $20. The giveaway will be open for one week. Stop by each day to see what else is on offer! Winners will be contacted via email two days after the giveaway closes and announced on the blog on Friday 7 December. How cute is the little monster and it is the perfect size for mine! I'd love to see a girls dinosaur for my little tomboy, or for boys a robot. Love your cute t-shirts that you have already though, especially the cool monster tee's. I would love to see woodland type animals- deer, owls, squirrels, foxes. I have done this theme for my nursery and love it for a gender-neutral theme! I would love to see a shark for the older boys. I love the monster it is adorable! Maybe a cute little owl? What a perfect gift this is!!! Love it! I love the one in the picture! A fox would be really cute.